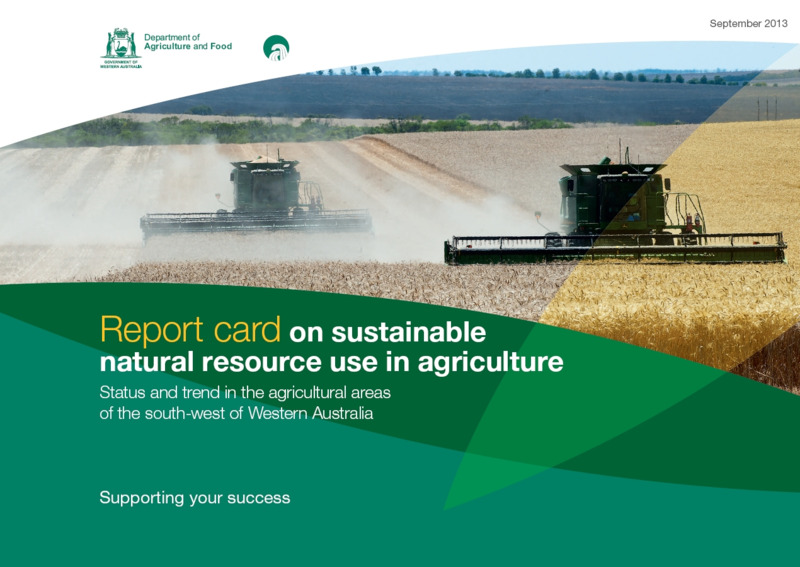 The Report card on sustainable natural resource use in agriculture: status and trend in the agricultural areas of the south-west of Western Australia was initiated and produced by this department to document information on status and trend in condition of the natural resources that support agriculture. Western Australian agriculture has made progress in some areas, such as managing wind and water erosion, but the status and trend in many indicators of resource condition have worsened. Western Australian agriculture has made progress in some areas, such as managing wind and water erosion, but the status and trend in many indicators of resource condition has worsened. 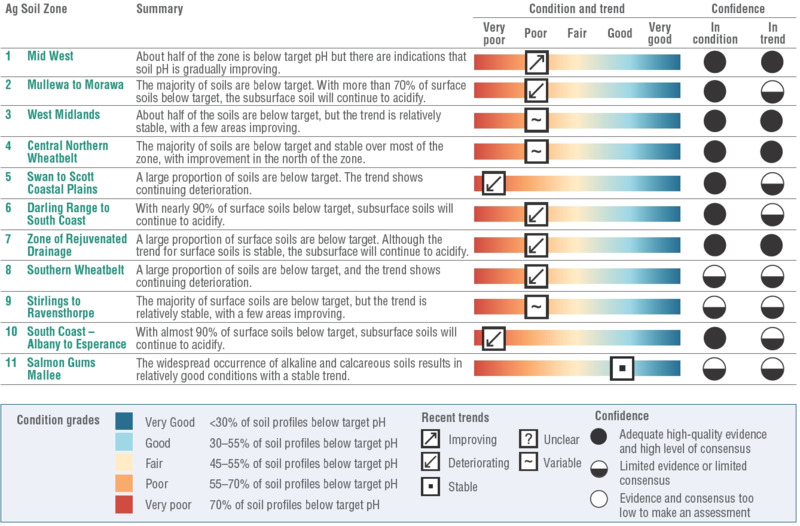 The report card summarised the status (condition or hazard indicator level) and trend of 10 natural resource themes affecting the agricultural resource base in the agricultural areas of the south-west of Western Australia (excluding native vegetation and reserves) in 2013. The condition of our natural resources is a complex interaction of numerous processes, driven by 3 primary factors: climate, land characteristics and land management. Land managers have no influence on climate, little influence on land characteristics, and considerable control over the impacts of land management practices. This report deals with the 10 natural resource themes individually (for example, soil acidity, salinity and water repellence). However, the processes within each of these themes are often linked to other themes. This means that acting on one theme is likely to affect other themes – all part of one system – and this may be a positive or negative affect. provides recommended actions where appropriate. The report can be downloaded as separate chapters or as the full report from the top of this page. Significant contributions to this report have also been made by the University of Western Australia and Precision SoilTech. Their support is gratefully acknowledged.